Brand New by Special Request!! We have had many requests for a breast cancer ornament. 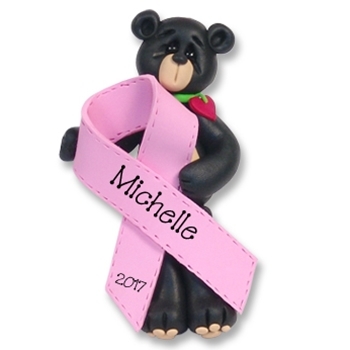 Our little Black Bear seemed to be the perfect choice for the breast cancer pink ribbon. He is a ray of hope for any cancer survivor or a memorial for someone who has passed on. This is one of Deb's limited edition ornaments. May be personalized with name, message and year. Choose your favorite or collect them all! Handmade from polymer clay By Debi Allison. Comes complete with hook and satin ribbon for hanging. We are more than happy to personalize it for you with a name and year absolutely FREE!. All polymer clay ornaments are hand made and may vary from the photograph. Personalization is also hand done. We do a very good job on personalizing but because it is done by hand it cannot be perfect. ALL ORNAMENTS IN OUR STORE ARE DESIGNED AND COPYRIGHTED BY ME AS WELL AS THE PHOTOGRAPHY.